I could tell that I was cut off before I finished that dispatch last night. I will try to pick up where, I believe, the connection stopped…. After we left the Park of the Demolished Monuments we went to a mall in the centre of Moscow, behind Red Square. By mall, I mean an indoor shopping mall that would look very familiar to anyone in the U.S. In fact we took lunch at a “food court” with many choices of fast food. The choices were international, but in Moscow, “international” means Georgian or Ukrainian or Russian…with various stalls selling pizza and ice cream as well, of course. Olga was her usual directive and helpful self…suggesting that we all take Ukrainian food, and selecting the items for us and helping count the rubles out. She was also heard to say, “Don’t forget to wash your hands”…to each member of the group before we sat down to eat. Her efficiency in helping us save time in the crowded mall was useful because at five minutes until 2 p.m., she hurriedly said, “We must go quickly to watch the changing of the Guard.” We ran outside just in time to see the ceremonial changing of the guard at the Kremlin. 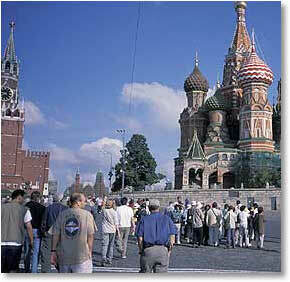 At this point I left the group with Olga and they continued on a walking tour inside the Kremlin. I went to have some dental work done. On the last climb I lost a crown while eating one of those chewy Starburst candies which was frozen on Elbrus on the summit morning. Helly found a great dentist for me. Now I can report that I have had dental work done in the following locations in the past few years: Akeruri in Iceland, Arusha in Tanzania, Moscow, and of course the dental clinic in Namche Bazar in Nepal, where I always have my teeth cleaned when I am passing through. My dentist in Canmore, Jerry Vanc, is the greatest, but a mountain guide with a mouth full of old dental work is often away from home when things go wrong. We will be off to Mineralnye Vody in just a few minutes. My next report to you will be from the Caucasus Mountains.